Lyon is the capital of the of the Rhône département, and also the capital of the Rhône-Alpes region in the southeast of France. Lyon is convenient to most of Central Europe. As a business center, Lyon's extensive transportation options can get you to other tourist destinations quickly and easily. There are direct Eurostar trains from London to Lyon. The urban sprawl of Lyon makes it the second largest metropolitan area in France after Paris with over 1.6 million people. Despite its size, the historic center of Lyon is compact and memorable. You won't feel you're in a huge city if you find a hotel around either of Lyon's rail stations. Access to Lyon by Train - Two Lyon stations exist in the town center: Part-Dieu and Perrache. There's a third at Lyon Saint Exupery Airport. TGV trains depart from the Part-Deiu station every half hour for the two hour trip to Paris. Lyon is 5 hours from London via Eurostar. Lyon Saint Exupéry airport is located 25 km from the town center and features excellent rail links with the high speed rail network of France. There is also a shuttle bus connection to Lyon from the airport, called the Navette Aeroport, that stops at the train stations as well. The Lyon City Card gives you free access to all Bus, Metro, Tramway and Funicular lines of Lyon, free and discounted admissions to many museums and shows, and some shopping discounts. The Lyon Card is available in 1, 2, or 3 day durations, and in Adult and Junior versions. Read more on the Lyon City Card. For the active traveler, the Lyon card can save you quite a few Euros. Lyon grew up between the Rhône and Saône rivers. To the west of old Lyon (vieux Lyon) is the Fourvière, dominated by Notre-Dame de Fourvière basilica, which you should visit. The Roman remnants along with Lyon's archaeological museum are here as well. Fourvière is reached by the funicular, which leaves from the base of the hill vieux Lyon spreads out from. There is a charge for the funicular, which is covered by the Lyon Card. Today, Lyon is divided into nine arrondissements. Most of your visit will be confined to the first, second and fifth arrondissements. 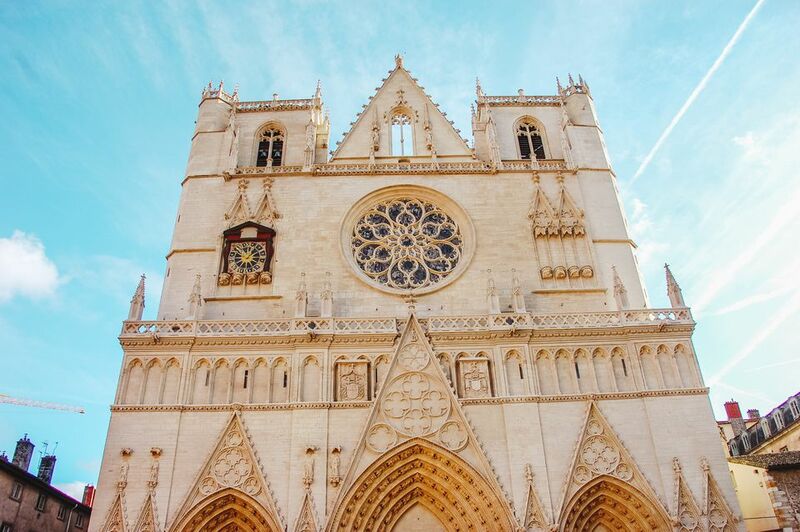 By the 18th century, Lyon was renowned throughout Europe for its silk production and carried on lots of trade with Italy, and Italian influence in the architecture of Lyon is evident. You can tour the silk weavers district in Lyon on the slopes of the Croix Rousse district. Lyon is the gastronomic capital of France and has​​ the highest concentration of restaurants in France. You won't have trouble getting a good meal in Lyon. Lyon is awash in traditional, inexpensive restaurants called "bouchons". Local specialties include "Cervelle de Canuts" a soft, herbed "silkweaver's" cheese, "tablier de sapeur" tripes, and salad Lyonnais. Lyon is a great place to learn how to cook with local ingredients. Plum Teaching Kitchen Lyon offers single-day classes, perfect to test what it's like to cook with Lyon's traditional ingredients. Lyon has quite a few interesting museums to visit. Considering its history, I really enjoyed the archaeological museum and the lesser known Museum of Miniatures; it's not something you see everyday. Lyon's Museum of Fine Arts is considered one of the best in France. Housed in a former abbey, the 7000 square meters offers a vast overview of art from ancient Greece and Egypt to the present. The antiquities collection is superb. Given Lyon's past link to textiles, a visit to the Textile Museum, housed in the 17th century Villeroy Mansion, might be in order. The Lumiere brothers made the first film in Lyon, so a visit to the Lumeire Institute might be a meaningful pilgrimage for fans of the cinema. Lyon served as capital of Gaul from its foundation in 43 BC to the early Christian era, and the Gallo-roman Museum Lyon-Fourvière follows the history by spiraling down the hill upon which the museum sits. Right outside is what remains of Roman Lyon, the Roman theater and odeum. And the best thing about Lyon? For me it just might be sitting in a cafe by the river in the evening and ordering a glass of wine to be sipped as the sun slides below the horizon and the monuments start lighting up. Just south of Lyon is the northern Cotes du Rhone, where you'll find some of the best wines of southern France.